UTI's occur most commonly when germs enter the urinary tract through the uretha, causing an infection to the bladder known as cystitis. If left untreated, the infection can travel to the kidneys, resulting in a much more serious infection, pyelonephritis. Due in large part to the differences in anatomy, women are more likely to contract a urinary tract infection than men. Once infection takes hold uncomfortable symptoms follow such as pain/burning sensation when urinating, pressure or cramping in the lower abdomen or back, Persistent need to urinate even after bladder has been emptied. 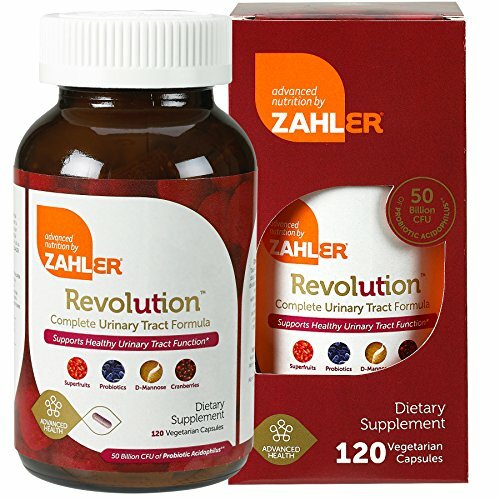 Zahler's UTI Revolution is as effective as antibiotics in treating UTI's without the unwanted side effects. And unlike antibiotics, UTI revolution actually helps prevent recurring infections. UTI Revolution contains a powerful blend of natural ingredients which provide fast-acting relief and promotes a healthy, properly maintained urinary tract for long-term health and well-being.